In an unassuming section of Bolivia‘s central highlands, you’ll find the alluring city of Cochabamba. Originally an agricultural center that provided food for the nearby mining district, Cochabamba today bears little resemblance to cities with a similar history in the U.S. In fact, when you first set foot in this city you might feel you’ve inadvertently been transported to southern California. Flashy condo buildings complete with swimming pools and fitness centers line the major roadways, while running down the middle you’ll find grassy strips dotted with soaring palm trees and showy flowering shrubbery. Walking and cycling paths cut across the city, and international restaurants pop up in various neighborhoods. But you’ll still find evidence of years gone by as well. In the 14 de Septiembre plaza you’ll find yourself surrounded by old colonial structures that now house businesses and apartments. The center of the plaza is home to old fountains, stone benches, and mature, shady trees. 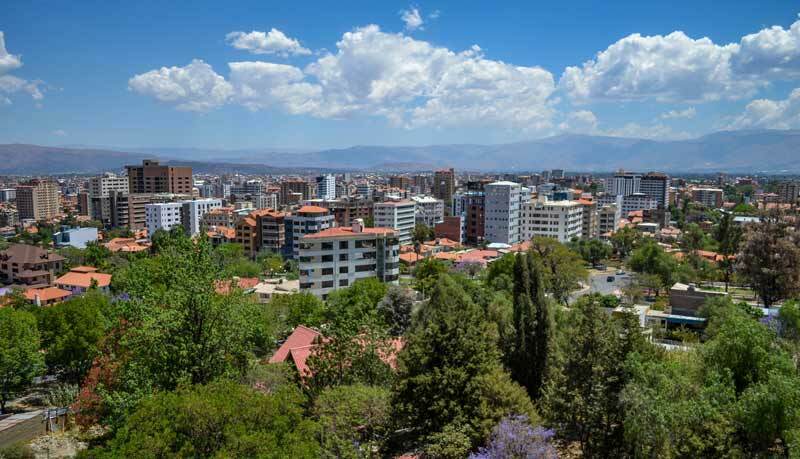 With a population of around 650,000 people, Cochabamba is a thriving city. Here you’ll find modern, well-run healthcare facilities. There are large grocery stores with fresh-baked bread, tender cuts of meat, local and imported wines, and all of the other food staples you would expect. Enjoy a night out at the new multi-theater Cine Center, or spend a lazy afternoon wandering through the city’s old colonial sector. In Cochabamba, you’ll find a variety of lifestyle options to meet nearly any need. The nicest neighborhoods are in the northern half of the city. This is where you’ll find the older, yet immaculately cared for homes of Bolivia’s upper class intermingled with new townhouses and high-rise condo developments. If you want a taste of old Bolivia, you can find that too. There are still street vendors selling hot empanadas, grilled meats, and ice cream cones for $1. If you’re adventurous, hit up La Cancha, one of the continent’s largest outdoor markets, on a Wednesday or Saturday. You’ll find everything here from spices and herbs to woven ponchos and fresh flowers. And don’t forget the weather. While Florida and Arizona attract retirees in droves thanks to their toasty temperatures, Cochabamba beats them both. The average temperatures for this Andean city range between 60 F and 70 F year-round and you’ll see plenty of sunshine too. Of course, you may want to head back stateside now and then to check up on your property there or to catch up with the grandkids. From Cochabamba, it’s easy to get back home. 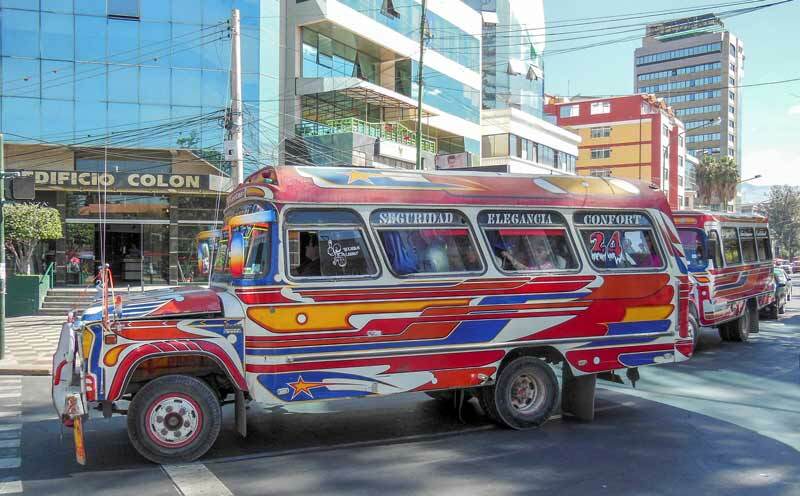 Bolivia’s national airline, BOA (Boliviana de Aviación), can get you to La Paz and back for $30. From La Paz you can get a one-stop return flight to Miami for $470. For most couples a budget of between $1,200 and $1,800 will provide everything you need to live comfortably in Cochabamba. A nice three-bedroom, unfurnished apartment with beautiful city views will cost around $350 a month. If you don’t mind spending a bit more, you’ll get an apartment of the same size with access to a pool and patio for parties or cookouts. This will cost you $450 a month. Or you can head outside of the metro area to some of the small towns that surround Cochabamba. A handful of expats have discovered the little village of Tiquipaya where they enjoy a rural lifestyle close to Cochabamba’s amenities. Eileen Velicky lives in this quaint town where she and her husband rent a three-bedroom house for just $200 a month, and they’re only 15 minutes away from the city by car. With such low-cost rentals, you’ll likely have money left over to enjoy your retirement. A night out on the town for two can easily cost you less than $50. Start your evening with a meal of high-grade sushi and a cocktail for under $25 for both people. Then head over to the newly constructed Cine Center to catch a new release on one of their many screens. A ticket will cost $5.79 for an evening viewing on the weekend or $8.39 for a 3D showing, though matinees and weekdays cost less. After the evening’s festivities you can sit on your balcony with a bottle of good local wine ($7) and take in the sparkling lights of the city as it sprawls through the valley.